Place the potatoes in a large bowl along with the yogurt and the mustard. Using a large spoon, toss to coat. Add carrot and celery, toss again. Sprinkle with chives and salt and pepper to taste. 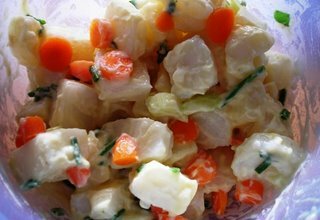 Using the same spoon, gently fold the potato salad over to incorporate the chives. 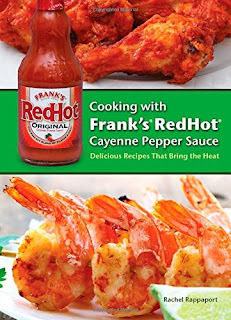 Suddenly Baltimore has turned into a pit of humidity and heat making it the perfect time to make and serve a cold side dish. This is a very low fat and healthier verison of a traditional deviled potato salad. I added the celery and the carrots to give it a nice crunch and since I am not a egg-in-potato-salad type person, it keeps the salad from being too bland. Dijon mustard perks it up as well. Did you know that you have to use mustard and spices to technically call something "deviled"? Just some trivia for you! Preheat oven to 325. Grease and flour or spray (with cooking spray with flour) a 9 inch springform pan. In a mixing bowl, whisk together, salt, flour, baking soda, baking powder, and cocoa. In a measuring cup or small bowl, whisk together the eggs, the vanilla and the milk. Pour the oil over the dry ingredients and stir until just mixed. Add milk mixture and combine thoroughly. Add boiling water, mix again. Pour into prepared pan and bake 40-45 minutes or until a toothpick inserted into the middle comes out clean. Cool 15 minutes in the pan on a wire rack then release and continue to cool. Ice. Especially good with chocolate cream cheese icing. I made this incredibly moist, single layer cake for my husband's 34th birthday. It is very chocolate-y and made just enough for us, a couple of friends and some leftovers for tomorrow. Now all I have to do is decide what cake he has to make me for my 27th birthday this summer. In a small saucepan, melt butter and chocolate together, whisking occasionally. Pour into a medium sized mixing bowl and allow to cool. Add cream cheese and mix thoroughly together. Add sugar and mix until well blended and spreadable. Spread on cooled cake. For a real chocolate treat, spread on chocolate birthday cake. This is a really quick, easy icing recipe. I used Hershey's baking chocolate and it came out great, velvety smooth, very chocolate-y and with just a hit of tang from the cream cheese. Preheat the oven to 350. Line 12 wells in a cupcake tin with baking papers. In a small bowl, whisk together the flour, baking powder, baking soda, and salt. Set aside. In a large bowl, cream together the butter, zest and sugar until fluffy, about 3 minutes. Add the eggs, one at a time, beating well after each addition. Stir in the juice. Alternately add the flour mixture and buttermilk, beginning and ending with flour. Fill each baking cup two-thirds full. 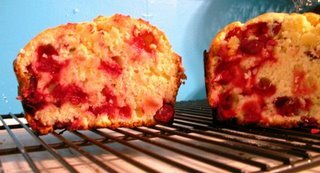 Bake until a toothpick inserted into the middle of a cupcake comes out clean, about 20 minutes. 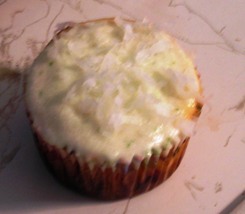 Ice with coconut lime icing. 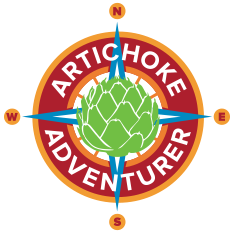 Tomorrow marks the second anniversary of my first post here at Coconut & Lime. 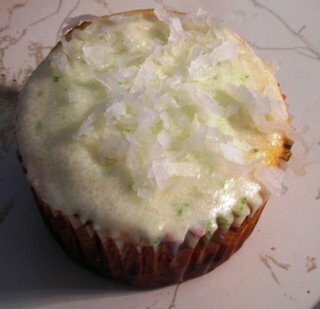 What better way to celebrate than with coconut & lime flavored cupcakes? The lime flavor is pretty strong and nicely accented by the coconut while still maintaining a light, tangy flavor. These may be my new favorite summer cupcakes. In a small bowl, combine butter,zest and sugar throughly. Add buttermilk and lime juice. Mix on high 1 minute until well mixed Spread over cooled cupcakes. Sprinkle each cake with coconut. This icing is barely more than a glaze but has a very strong lime flavor. You can see the flecks of zest peeking out when you bite into the cupcake. This icing is excellent on buttermilk lime cupcakes. In a large saucepan, heat the oil. Add potatoes, garlic and onions. Saute, stirring occasionally for about 5 minutes. Add salt, pepper and sage. Continue to saute, stirring occasionally, for about 15-20 minutes or until potatoes are softened. 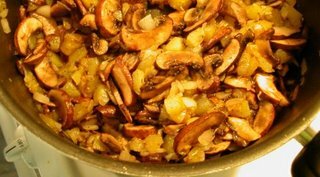 Add mushrooms and saute an additional 2-4 minutes or until they have cooked down. Serve immediately. We had bought steak for dinner and couldn't decide on a side dish. We had some rapidly deteriorating mushrooms in the fridge and a couple of potatoes and this is what we came up with. The flavors complement each other perfectly. While we had it as a side dish for dinner, it would also do well at breakfast time, think of it as fancy home fries. In medium saucepan, fry the bacon until crisp, then remove it to a paper towel lined plate and reserve. Pour out all but 2 tablespoons of the bacon fat from the pan. * Add the cabbage, onion, and garlic. Saute 5-10 minutes, mixing thoroughly. Add water, cover, and cook for 30 minutes stirring occasionally. Then add vinegar and mustard, re-cover and cook for 15 more minutes until tender. Add bacon and cook 5 minutes to warm through. *I like to pour it all out in a heat safe measuring cup, measure out the needed amount and discard the remainder. My husband had bought a head of Savoy cabbage with thoughts of adding it to some matzo ball soup he was making. When I nixed the idea he was left to figure out another use. 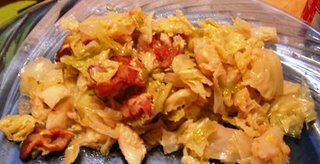 He came up with this recipe which contains two of my all time favorite foods: cabbage and bacon. 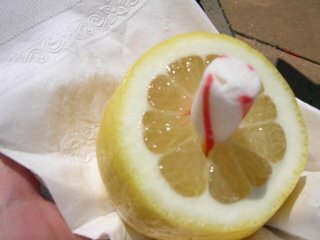 It was so delicious, you have no idea. It wasn't overwhelmingly bacony or cabbagey, it was tangy and perfect. I may or may not have eaten 3 servings. Preheat oven to 250. In a medium saucepan, bring the corn syrup and sugar to a boil, stirring occasionally. Continue to boil for 5 minutes, stirring occasionally. Meanwhile, spread popped popcorn out on a 9x13 baking dish, careful to remove any unpopped kernels. After the 5 minutes, add the salt, vanilla and baking soda, stir. Carefully pour over the popcorn. Using a spatula, turn the popcorn to coat. Place in the oven and bake 30 minutes, stirring occasionally. Cool and serve. Store any leftovers in an air tight container. 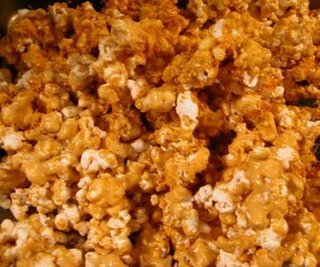 I never thought you could make caramel popcorn at home but you can. This makes a fairly crisp caramel corn, more like what you might find in packaged caramel corn than the chewier kind that you may find sold warm on the boardwalk. 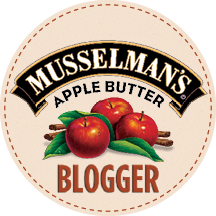 It's a has a good caramel taste and it's so easy, it's a great (low fat) alternative to just eating buttered popcorn on movie night, or as it is around here, Gilmore Girls night. Preheat oven 350. Spray with baking spray (with flour) or butter one large loaf pan. Toss together 1/4 cup of the flour with the rhubarb and set aside. In a large bowl, cream together butter, lime zest and both sugars. Add baking soda, oats and salt, mix briefly. Add buttermilk and remaining flour alternately, combining well, between each addition. Gently fold in rhubarb. Pour into pan and bake about 60 minutes or until a wooden pick inserted in the center comes out clean. Cool in pan 8-10 minutes then remove from pan and continue to cool on a wire rack. I had never made anything with rhubarb before today. In fact, I think I had only had rhubarb once before, along side strawberries in a pie. When I saw rhubarb at the store I wasn't sure what do with it but it looked so fresh and pretty I couldn't resist. 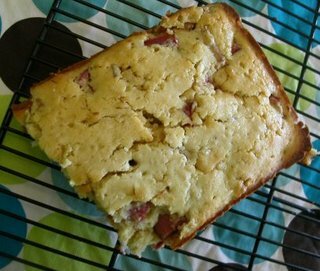 I have been seeing rhubarb recipes every where, including some for rhubarb bread but none that really called out to me. 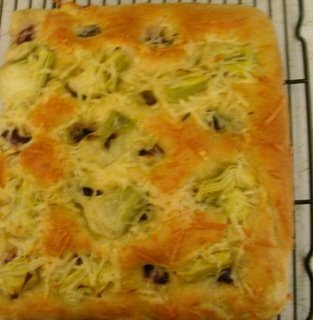 I decided to try my hand a creating a new bread recipe using some ingredients on hand. It came out really well. The oatmeal makes it homey but the lime zest combines with the rhubarb adds a bright fresh flavor.